Prunes and chocolate is a winning, but often overlooked combination. 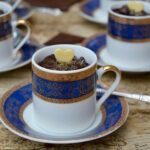 These spiced prune chocolate pots with amaretto are a particularly indulgent way to eat them. They make for a sumptuous dessert and are ideal dinner party fare. With flavours of orange, clove, nutmeg and allspice as well as amaretto, they would also make a good alternative dessert to Christmas pudding during the festive season. I don’t know if anyone watched the Superfood series on Channel 4 that was on recently, but I really enjoyed the few episodes I saw and I learnt quite a lot. Who knew that Astronauts were fed prunes every day to keep their bones strong? I certainly didn’t. I add prunes to my porridge when I make it, but they’re not something I eat on a regular basis. Now I’m in the know, I’ve been trying to figure out how to incorporate more of them into my diet. These spiced prune chocolate pots with amaretto seemed like a good start. My recipe is adapted from Ann Carr’s Recipe Collection – purée of prunes with chocolate. I changed the quantities completely, deciding that the ratio of chocolate to prunes needed to be much higher. I also altered the spices, omitted the sugar and added amaretto – why wouldn’t you? The result is a rich, unctuous and distinctive dessert. A little goes a long way, though that didn’t stop CT asking for seconds. I made five good servings out of the quantities I used, but you could make four slightly larger ones if you’re feeling indulgent. The recipe is a very simple one and as it can be made in advance, it’s perfect for serving up at a dinner party or any other occasion when you need to be particularly organised. I used my Optimum Nutri Force Extractor to blitz the prunes into a puree, but you could use a mini food processor or stick blender instead. If you like the idea of prunes and chocolate together, I can also recommend this spicy chocolate & prune gingerbread. These little pots of unctuous delight make a fantastic dinner party dessert or alternative to Christmas pudding. Place the prunes in a small pan and cover with water. Add the orange peel, clove, allspice berry & nutmeg. Bring to the boil and simmer for 10 minutes. Remove the orange peel and clove and puree the rest using a stick blender or mini food processor. I used my Optimum Nutri Force Extractor. While the prunes are still warm, add the butter and chocolate. Leave for a few minutes to melt, then stir until smooth. Finally stir in the amaretto and spoon into little ramekins or chocolate pots. Can be made the day before serving. For a special occasion, decorate with gold leaf, alternatively grate some chocolate over the top or add a dusting of glitter. These spiced prune chocolate pots with amaretto are my entry to November’s #WeShouldCocoa. If you’ve blogged any recipes using chocolate this month, do join in. I’m also linking up with #CookBlogShare hosted this week by Recipes Made Easy. They also go to The Baking Explorer for Treat Petite. And to Searching for Spice for #CookOnceEatTwice. They lasted us three days, with the fifth one fairly shared between the two of us – sort of! Thanks for visiting Tin and Thyme. 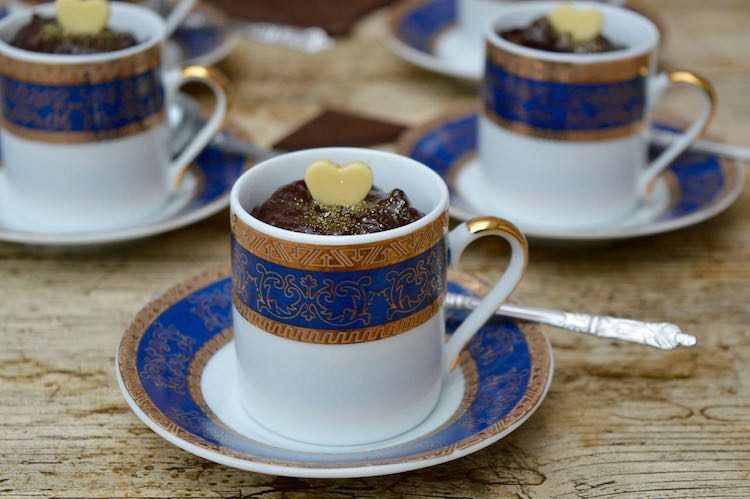 If you make these spiced prune chocolate pots, I’d love to hear about it in the comments below or via social media. Do share a photo on social media too and use the hashtag #tinandthyme, so I can spot it. For more delicious and nutritious recipes, follow me on Twitter, Facebook, Instagram or Pinterest. Spiced Prune Chocolate Pots. PIN IT. Sounds like a perfect holiday dessert, Choclette. Thanks Angie, I think these prune chocolate pots might become a regular festive feature. So cute in those teacups! And sounds delish!! YUM! Thanks Jennifer. A pretty cup certainly helps with the presentation, but these puds are scrumptious. I didn’t watch the Superfood series, but I’m fascinated to learn that they feed astronauts prunes! It’s not something which we often eat but I’m popping them on my shopping list now! Love that you finished your chocolate pots with a little gold leaf – it really does make it look so special! Glitter rules at Christmas, so we’ve both got that one sussed with our festive desserts 😉 I love learning about different foods and their properties. It makes me realise that food can never be a boring subject. Ooh yes, your prune and bean casserole sounds divine. I’ve used them recently in bean burgers and they worked well there too. I will eventually get around to blogging the recipe. I’ve also made a chocolate prune cake – yum! Thanks Camilla. I’m delighted by the dessert and the cups are just perfect for chocolate desserts like this. I love how you make recipes your own by changing many of the ingredients! Adding amaretto is perfect for this time of year. These are a perfect pud for entertaining over the winter and Christmas period I think! The combination of prunes and chocolate sounds delicious and I love the presentation with the gold hearts. Thanks for linking to my recipe too. They are absolutely gorgeous! I knew prune was good for you, but I have to confess I never eat them, I think this recipe could convince me to start! Try prunes with chocolate Kat, they are delicious. Prune and chocolate cake is a good place to start. Goodness- I didn’t know that about astronauts and prunes! What an interesting fact! Healthy chocolate desserts are always a winner, especially this time of year when the cold, dark nights require a little treat or two! Thanks Janice. Are apostle spoons a thing in Scotland? You and Claire are the only ones that have ever commented on them. These sound delicious and I love the presentation! I do like prunes but have to admit that I very rarely eat them; if they help keep your bones strong then I really should have them more often. I absolutely love Amaretto so these sound right up my street. These would make such a lovely dinner party dessert! Yes, I find Amaretto very hard to resist. It reminds me of being a student and making friends with an Italian waiter who used to ply us with the stuff. Oh heady days! What a lovely chocolate. I have never thought of flavouring it with prunes. Very inventive and delicious. It rather depends on the type you get, but they’re not nearly as sweet as dates. I wasn’t very fond of them when growing up, but I love them now. Thanks Jacqui. Those coffee cups are perfect for this sort of dessert and their photogenic too. Most beautiful dessert! I love prunes and chocolate combination, and with an added amaretto it is a perfect seasonal treat! They look delicious! Great for an after dinner dessert 😀 I don’t think I’ve ever used prunes in recipes before, not sure why! You’ve inspired me to try prunes in desserts! Also that Superfood series sounds right up my street! I’ll have to see if I can watch it on catch up. Oh do watch it if you can Nadia. I only saw some of the episodes and keep meaning to catch up with the others. Prunes are also well worth trying, especially with chocolate.